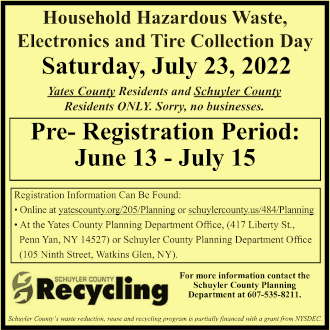 SCHUYLER COUNTY—Deed transfers recorded in the Schuyler County Clerk’s office for July 2009 follow. The listing includes the location and amount of consideration calculated from the transfer tax. Transfers are taxed $4 for every $1,000 of consideration exchanged. Andrew R. and Claudia J. Morrow to Mary Beth Lerner, Montour Falls, $235,000. James R. Hazlitt Jr. to Douglas J. Hazlitt and Leigh Hazlitt Triner, Hector, $30,000. Philip J. and Eleanor T. Cicerchi to Rebecca Cain, Hector, $240,000. Douglas W. Teed to Paul W. Jayne, Reading, $10,000. Deutsche Bank National Trust Co. to Brenda Coyles, 6030 Route 79, Mecklenburg, $106,000. George M. and Jeannine Hatch to Renee J. Hatch, Dix, $35,000. Frederick J. Bulton and Dwane W. Edwards to Marcia B. and Kurt R. Bischoff Sr. and Theresea M. and Bradley R. Clark Jr., 576 to 578 Lamoka Lake Road, Tyrone, $185,000. Dorothy Huey to Mickey C. and Kathleen M. Keeter, Tyrone, $0. Michael E. Jonascu and Pamela Jean Harwood to Richard and Marina M. Delaney, Hector, $299,000. Sarah McFarland to Robert L. and Diana A. Groll, Hector, $140,000. Raymond Carmody and Michael J. Lehmann to Wayne Jelliff, Catharine, $0. Elaine E. Hazlitt to James R. Hazlitt Jr., 5631 Route 414, Hector, $60,000. Robin M. Davis to Roberta M. Xavier, Watkins Glen, $80,000. Joshua M. and Ricci L. Curren to Brian E. and Rebecca Cameron, Hector, $120,000. George A Baker to Earle E. and Linda Ferris, 211 Seventh St., Watkins Glen, $0. John M. and Christine C. Crane to John M. Kessler, Hector, $385,000. Frank M. Gugliotta and Deborah M. Cox to the town of Catharine, $160,000. J. David Coolican to Watkins Home LLC, Watkins Glen, $125,000. Richard Figiel and Deborah Pfautsch to Katharine J. and Katherine L. Biers, Hector, $227,500. Donald and Vivian Shaut to Terri Kaye Marcellus, Tyrone, $201,000. Rose Beek to Gilbert Leroux, Tyrone, $20,000. Vincent J. Welch to Leslie A. Benza, Reading, $59,000. Thomas D. and Lisa A. Webster to Darrell J. and Cheryl J. Fornham, Orange, $35,000. Frank LeFace, Ann Marie Gibson and Jeanne LeFace to Stephen F. and Sheila Klemann, Reading, $160,000. James C. Kurtz to Charles A. Hayes, Montour Falls, $5,000. Casella Waste Management of New York to Inergy Midstream LLC, Reading, $140,500. David and Karen M. Monell to Roger L. and Sandra J. Jimerson, Tyrone, $170,000. Jacqueline Agostinelli and William Neugent Jr. to New York Land and Lakes Development LLC, Montour Falls, $219,500. Steven and Christie Shaffer to Drew Bubb, Watkins Glen, $75,000.